New gas-fired and dual-fuel generation coming online in the next few years will be enough to maintain reliability after the 2,311-MW Indian Point nuclear plant shuts down completely in 2021, NYISO said Wednesday. 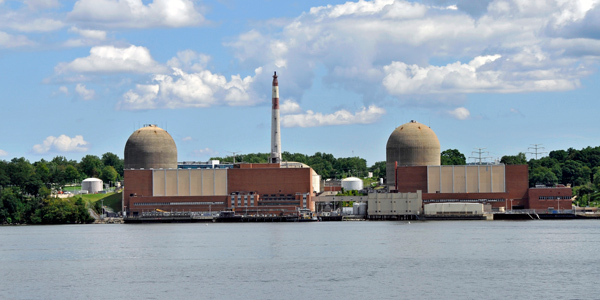 An ISO report assessing the reliability needs arising from the staggered closure of Indian Point Units 2 and 3 cited three major projects totaling 1,818 MW now under construction: the 120-MW Bayonne Energy Center II uprate in NYISO Zone J, and the 678-MW CPV Valley and 1,020-MW Cricket Valley plants in Zone G.
The report also analyzed a scenario without the three new projects. The Lower Hudson Valley (Zones G-J) would need other solutions to maintain reliability, “including generation, transmission, energy efficiency and demand response measures.” Transmission constraints into the valley from upstate (Zones A-F) and Long Island (Zone K) would make additional resources in any other zone unable to effectively resolve a deficiency, the report said. While a generic addition of at least 200 MW by 2023 anywhere within Zones G-J would resolve the deficiency over a five-year horizon, a deficiency through 2027 would require additional resources ranging from 400 to 600 MW, depending on type and location of the resources within the valley, the ISO found. 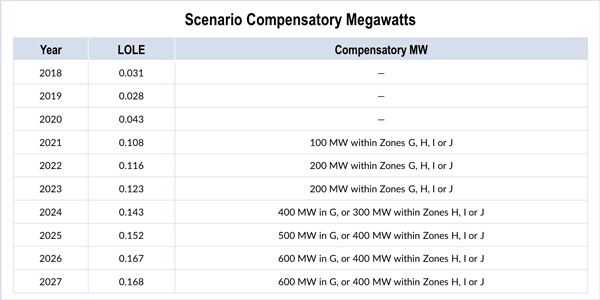 The ISO determined the new capacity needed to compensate for the loss of Indian Point under the scenario by adding generic “perfect capacity” resources to zones in 100-MW blocks. “Perfect capacity” represents a hypothetical resource not subject to derates and not tested for transmission security or interface impacts. New York City and Westchester County depend on Indian Point for 25% of their electricity, and the village of Buchanan and surrounding area rely on it for jobs and taxes. Gov. Andrew Cuomo in February formed the Indian Point Closure Task Force to explore ways to mitigate local tax and workforce impacts. The group next meets on Dec. 19 in Cortland. Entergy agreed to deactivate Units 2 and 3 by April 30, 2021, under a deal reached with Cuomo in January. The agreement would allow the plants to operate for two additional two-year increments — with final closure slated for 2025 — if an emergency affected reliability in the New York City area. Unit 1 at the plant was shut down in 1974. Contrary to an earlier analysis, the closure of Entergy’s FitzPatrick nuclear plant will not leave New York short of generation in 2019. NYISO CEO Brad Jones and PSC Chair Audrey Zibelman told New York legislators they are not concerned about replacing the capacity of the Indian Point nuclear plant.